It's been fascinating tracking The Decemberists' evolution over the years. Hyper-literate, thematically quaint and theatrically bent, their playful, broad indie-folk won over a huge number of fans throughout the aughts until band leader Colin Meloy's proggier tendencies got the best of him on the band's weakest, most bloated effort, the 2009 rock opera The Hazards Of Love. Ever since that turning point, the band has been in clear "back to basics" mode. 2011 found the band teaming with the likes of Gillian Welch and REM's Peter Buck to move in a simpler, more alt-country direction with the surprise hit album The King Is Dead. Then, after an extend hiatus, 2015's What A Terrible World, What A Beautiful World found the band once again striving to keep things simple, but this time abandoning the countryish direction of King to instead focus more on the subtleties of pure instrumentation than they ever had before. The result, while not from their best album, is without question their most impressively arranged, with no better example of that additional attention to instumental detail than the album's immaculate, gorgeous centerpiece Lake Song. Coming in at #60 in our best songs of 1967 countdown, So Long, Marianne, Leonard Cohen's public parting gesture to his romantic partner of the previous seven years and one of the most famous "muses" in twentieth century lore, Norweigian Marianne (Ihlen) Jensen, whom Cohen originally met on the Greek isle of Hydra soon after her first husband, poet Axel Jensen, had abandoned her and their newborn son. Over the years, Cohen would write many songs about Marianne, and his final brief letter to her just days before she passed in 2016 has already become the stuff of legend, but no song inspired by "the most beautiful woman" Cohen ever knew has stood the test of time like this one. 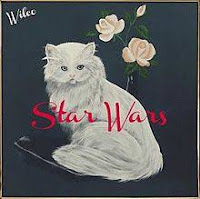 Initially made available as a free download with no prior announcement in July of 2015, Wilco's 11th studio album Star Wars is as relaxed and off-hand an effort as one would expect given the album's super casual release strategy. But despite, at least by Wilco's standards, the intentionally unambitious nature of record, there's still much about Star Wars to like. A bit spikier and more rough hewn than we've grown accustomed to from this later, more stable edition of the band and devoid of any knock-out tracks, Star Wars is nonetheless a very light, playful record with an appealing "Super Hits Of The Seventies" vibe, easy with just one or two exceptions (see opener EKG) to take-in, and brings with its relaxed nature a welcome willingness to experiment (again see opener EKG). Ironically, if there is there is a standout track, it's the song that most goes against the album's overall mood, the half-formed, surging murker You Satellite, which would have felt right at home on the band's all-time best effort, the darkly schizophrenic A Ghost Is Born. On the playful side, Random Name Generator, That Joke Explained, and Pickled Ginger bring the most heat, while Taste The Ceiling is a nice, straight-forward alt-country ballad. And that's all there really is to say about this album, not something that will be of much interest to more casual listeners, but a nice valentine for fans. Cherry Picker's Best Bets: Random Name Generator, You Satelite, Taste The Ceiling, Pickled Ginger. Here's are live videos for Random Name Generator and Taste The Ceiling. McQ's #61 Song Of 2015 - THE WAIT - Tobias Jesso, Jr.
One of two tracks to make our 2015 top songs countdown from singer-songwriter Tobias Jesso, Jr.'s endearing debut Goon, the indelible, gentle-as-a-breeze The Wait, while clocking in at just 2:15, is possibly the sweetest, most earnest McCartney-esque song on an album loaded with sweet, earnest McCartney-esque songs. Coming in at #61 in our best songs of 1967 rankings, one of the first rock 'n' roll songs to go full on meta, The Byrds' So You Want To Be A Rock 'N' Roll Star. Released in January 1967 as the lead single for the band's soon to follow fourth LP Younger Than Yesterday, the song charted well in the United Kingdom, but didn't make much of a dent in the States. Some attritibuted this failure to reach an audience in America to the song's bitter, ironic tone, a perception heightened by the widely held belief that that the song was a specific, cynical reaction to the rapid-fire ascent of the pre-frabricated Monkees. But in interviews over the years, while never dismissing The Monkees angles, the band has suggested other inspirations might also have been at work. On the dark side, by this point in their careers, the band had been near the top of the game for over three years, so to them the song was as much about dealing with the pressures of staying on top after having already achieved success as it was about skewering the 1967 pop scene. And on the lighter side, they've also referenced a 1966 moment when paging through a rock and roll magazine where they realized they hardly recognized anyone being profiled, and encouraged by all the rising enthusiasm for contemporary music, also wrote the song as a genuine, albiet humorously toned, nudge to all those future rock 'n' rollers eager to get in the game. But whatever your own interpretation of the song, it's hard to deny the track its place, with Chris Hillman's insistent, innovative-for-the-times baseline, high in the upper-tier of the band's canon. The song was also the band's first to incorporate brass into their sound, courtesy of South African Hugh Masekela, whom Hillman had been working with on a separate project at the time. Do you push forward on your next effort, try something new, and broaden your stylistic range, or do you go to your strengths and double down on what your fans responded to in the first place. 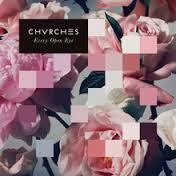 In the case of Scottish synth-pop act Chvrches, there is no doubt than on Every Eye Open, their follow up to their 2013 full-length debut The Bones Of What You Believe, they have chosen to double down. Gone is any trace of the light experimentalism, ala Science/Visions, that was peppered throughout Bones. In its place, an unrelenting phalanx of maximal synth-pop bangers, tailor-made for today's mega-festival main stages. And while the album is unquestionably aiming to expand upon the band's mainstream appeal, there is still a lot here that more indie-oriented sorts like me will find appealing. Lauren Mayberry's pixie-throated voice, while not unique in tone or delivery, is clear, crisp, well fit to this kind of material, and has an appealing lilt to it as she emotes. Bandmates Iain Cook and Martin Doherty definitely know their way around today's cutting-edge synths and sequencers, and most importantly, the band has an unerring ear for hooks. But on the downside, while the hooks prevent even the weakest tracks from slipping too far off the rails, the repetitive design of these songs, coupled with a pervasive whiff of genericism (on many of these songs it even feels like the verses have been intentionally blanded out to allow the choruses to hit harder) prevents any song from truly taking flight. Of those tracks that do rise a touch above the rest, opener Never Ending Circles, Clearest Blue, and personal favoite Bury It are the best of the bangers. High Enough To Carry You Over and Afterglow also stand out, though here less so qualitatively and more so just because they're the only two songs that differentiate themselves musically in any significant way - High Enough To Carry You Over featuring a nice Martin Doherty lead vocal, and closing ballad Afterglow offering the album's one welcome repreive from all the hooky up-ness that dominates the rest of the record. But in the end, as an overall assesment of Every Open Eye, I fear Chvrches have made the same mistake on their sophomore LP that Florence + The Machine did on their second effort Ceremonials - focusing in such a calculating manner on their obvious strengths at the expense of everything else that they've created an album that while hard not to like, is even harder to love. Cherry Picker's Best Bets: Never Ending Circles, Clearest Blue, Bury It, Afterglow. Here's the official videos for the album's three strongest songs, Never Ending Circles, Clearest Blue, and Bury It.